Snow storms outside, cash cycle management solution highlight inside. 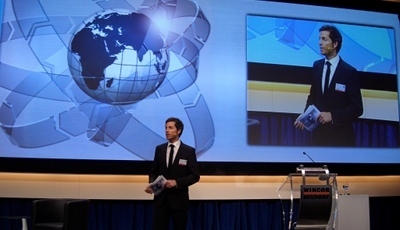 In January 2010, I had the honor to work as a moderator for Wincor Nixdorf in Paderborn at the Wincor World 2010. A total of more than 7000 visitors from over 90 countries around the world had an opportunity to gather information on 600 IT solutions and services exhibits. The team of Head Of Event once again showed their expertise and great teamwork in organizing such an event.